A presentation on this energy scavenging technology was given July 6 at the IEEE Antennas and Propagation Symposium in Spokane, Wash. The discovery is based on research supported by multiple sponsors, including the National Science Foundation, the Federal Highway Administration and Japan‘s New Energy and Industrial Technology Development Organization (NEDO). Communications devices transmit energy in many different frequency ranges, or bands. The team’s scavenging devices can capture this energy, convert it from AC to DC, and then store it in capacitors and batteries. The scavenging technology can take advantage presently of frequencies from FM radio to radar, a range spanning 100 megahertz (MHz) to 15 gigahertz (GHz) or higher. The scavenging device could be used by itself or in tandem with other generating technologies. For example, scavenged energy could assist a solar element to charge a battery during the day. At night, when solar cells don’t provide power, scavenged energy would continue to increase the battery charge or would prevent discharging. The researchers are utilizing inkjet technology to print these energy scavenging devices on paper or flexible paper-like polymers – a technique they already using to produce sensors and antennas. 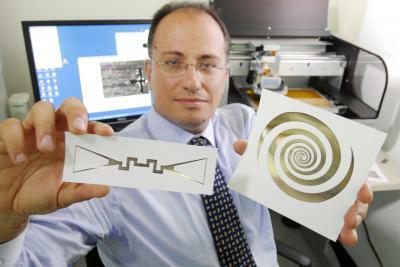 The result would be paper-based wireless sensors that are self powered, low cost and able to function independently almost anywhere. To print electrical components and circuits, the Georgia Tech researchers use a standard materials inkjet printer. However, they add what Tentzeris calls “a unique in house recipe” containing silver nanoparticles and/or other nanoparticles in an emulsion. 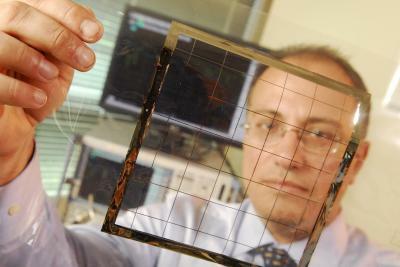 This approach enables the team to print not only RF components and circuits, but also novel sensing devices based on such nanomaterials as carbon nanotubes. Energy savings: Self-powered wireless sensing devices placed throughout a home could provide continuous monitoring of temperature and humidity conditions, leading to highly significant savings on heating and air conditioning costs. And unlike many of today’s sensing devices, environmentally friendly paper-based sensors would degrade quickly in landfills.